Jaimie Alexander Brings 'Blindspot' to NY Comic-Con 2018! Jaimie Alexander is all smiles as she speaks on stage at the 2018 New York Comic-Con on Saturday (October 6) at the Javits Center in New York City. The 34-year-old actress looked chic in black leather outfit and heels as she stepped out for the panel discussion for her hit show Blindspot. Season four of Blindspot premieres on Friday, October 12 at 8pm ET on NBC. 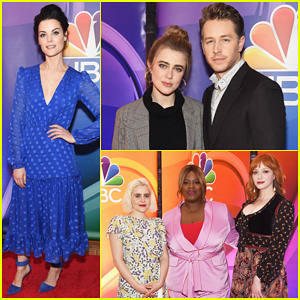 Jaimie Alexander & New Boyfriend Tom Pelphrey Make It Official at EW & People's Upfronts Bash 2018! Jaimie Alexander & Ellie Kemper Get Dolled Up for CFDA!